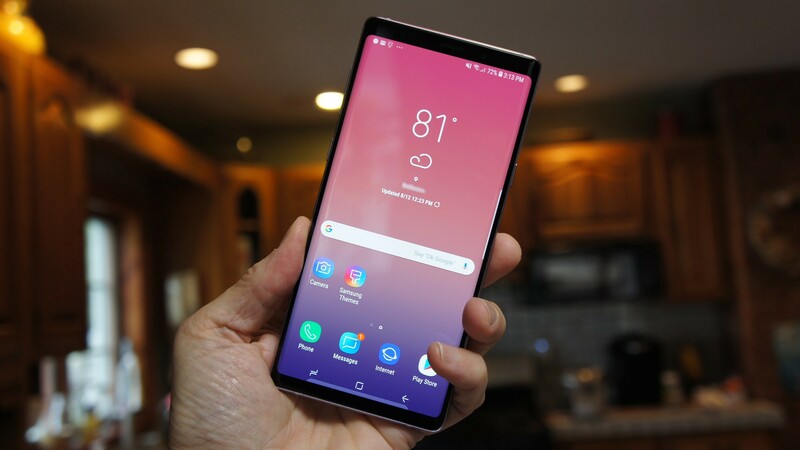 Samsung’s Galaxy Note 9 is big, thick, heavy, and currently my favorite Android phone of all time. I’ve been using my fingers on the iPhone for over a decade, but enjoy having ready access to a smart stylus, the S Pen, which is as good a drawing implement as it is a remote control. I will never truly love Samsung’s penchant for over-saturated colors, but I still found much to love about the Note9’s 12 MP dual camera system. And even though the Geekbench numbers show the Snapdragon 845 lagging behind Apple’s A11 Bionic, there’s virtually no evidence of it in the smartphone’s operation. It’s a beast and a workhorse and I know that I’ll be sad when it’s time to return it. Of course, I’m getting ahead of myself here. Let’s start over with the Samsung Galaxy Note 9’s design. Though some may consider Samsung’s largest Android phone its flagship device, the technology migration proves otherwise. The Note line often inherits what’s best from the latest Galaxy S series, in this case the S9 and S9+, and doesn’t appreciably move the bar forward in any area. Yes, you get a headphone jack. That’s only partially true for the Note 9. Yes, it gathers its camera technology from the S9+, including the dual aperture (f1.5-to-f2.4), but Samsung did a bit of a slipstream upgrade, boosting to a noticeable degree the HDR and low-light performance. What I like about the Galaxy Note 9 over the Galaxy S9+ is that instead of a tall-narrow design, the Note 9 is wider for a true big-screen experience. It does this without adding a single pixel to the screen resolution; both are 2960x1440.The Note 9’s 161.9 x 76.4 x 8.8mm rectangular body (slightly wider, a hair shorter and thicker than the Note 8) and more pronounced though still chamfered corners, might strike some as less elegant. Yet, all I see is that big, beautiful screen. If I have one criticism of this QUAD HD display, it’s that the screen curves do slightly distort anything that’s along the two long edges of the display. Beside the volume control is a Bixby button. Even though the camera module sits vertically on the back of the S9 and S9+, the Note 9’s wider chassis is a perfect canvas for a horizontal layout that puts the dual camera lenses, the 4LED flash and the heartrate monitor on a single plane. With the Note 9, Samsung smartly put the fingerprint reader right below that box, though since the phone has facial recognition and iris scanning, which worked very well, I almost never used it. Other notable body features include the USB-C port on the base (which I didn’t use very often because I had the Duo wireless charging base, but more on that later), the 3.5 mm headphone jack to the left of it and the mic and speaker to the right. The second speaker is on the face between the IR sensor and selfie camera. On the far right is the distinctive S Pen. 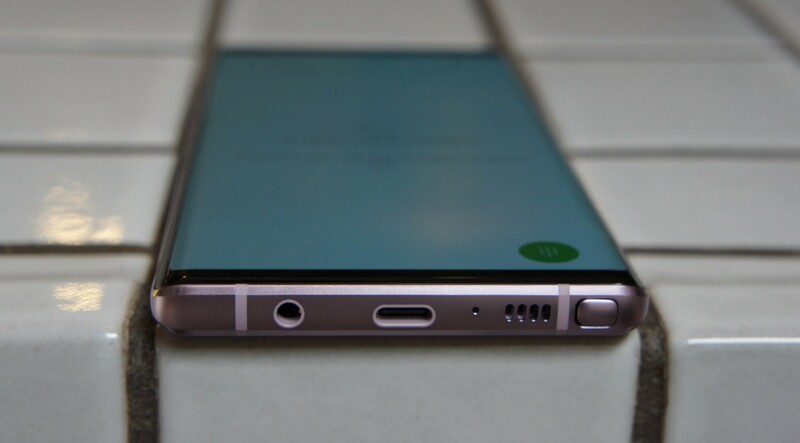 The rigid metal body is sandwiched between two gleaming Gorilla glass covers. The back, in particular, is a showcase for greasy fingerprints. There is a lot to love about the Infinity display. As I noted above, the sides extend almost to the metal edging, while the top and bottom edges stop a few millimeters short. Its button-free screen is notch-free and the overall look is softened with gently curved corners. The design is so clean. Everything looks fantastic on it. The display defaults to Full HD+ (2220x1080), but you can change it to QuadHD (2960x1440) in the settings, not that I noticed much difference between the two. Aside from size, nothing sets the Note 9 apart from the pack like the S Pen. It’s both a throwback to a bygone era of PDAs (ask your parents about them) and a function-forward accessory that improves the phone’s overall creativity and utility. When I used a Palm Treo 700p more than a decade ago, I prided myself on keeping the built-in stylus holstered as I learned how to use the tiny physical keyboard. 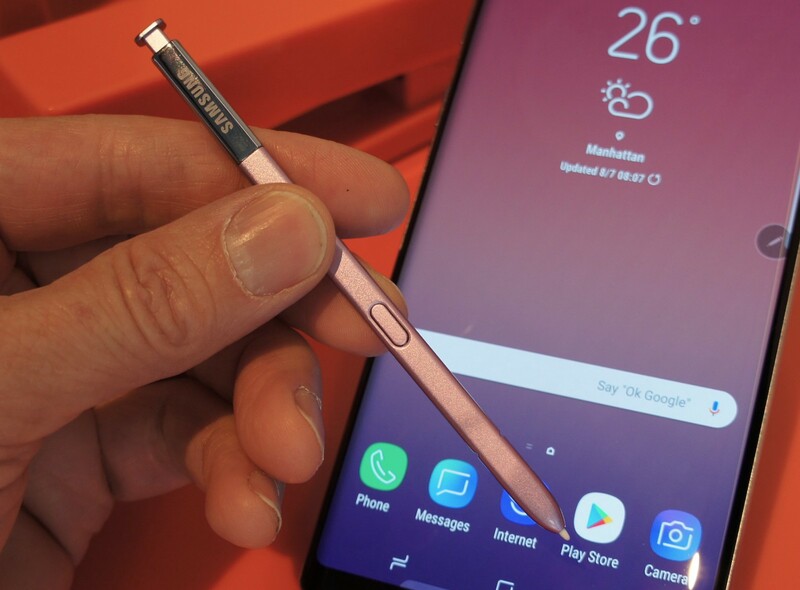 With the Galaxy Note 9, I look forward to taking out the 4.5-inch long implement to tap the screen, take notes (even on the sleep screen), and draw (with pressure sensitivity). It’s lightweight, responsive and comfortable to hold and use. The addition of Bluetooth low energy and capacitive charging is impressive, but even more so because of the smart new ways I can use the S Pen. The S Pen is an excellent companion for Microsoft PowerPoint. I installed the app and opened my Office 365 account, so I could access my library of presentations. As soon as I took out the S Pen, a small message appeared on the phone screen explaining how I could use it to control the presentation: A single press of the S Pen’s button to advance my slideshow and a double press to go back and I can control it from up to 30 ft away. I tested this by leaving the phone in my guest room and walking to the other side of my house. I could still see the phone and controlled the presentation from there. Obviously, the scenario makes a lot more sense in a business environment. Samsung’s Android desktop system, DeX, is built into the phone. All you need is a USB-C HDMI-out adapter and then you can hook it up to a big screen and run the presentation via S Pen while standing in the back of the boardroom. The new S Pen is the perfect selfie companion. Sure, I can stretch my arm out and press the phone’s volume button to grab a shot or use Samsung’s integrated gesture control for a more hands-free selfie capture experience. However, S Pen makes it possible to hide the artifice. I can hold the S Pen at my side, well out of frame, and press the S Pen button to capture a photo. And if the Note 9 opens the rear-facing camera first, a double click of the pen button switches to the 8 MP selfie camera. All this fresh utility encourages me to use the S Pen far more often than before, but it also increases the opportunities for leaving it behind or losing it. At least that’s what I thought. After using the S Pen with the Note 9 for a while, I grabbed the phone and left my home office. I took about 20 steps before a message popup up on my Note 9 screen advising me to “Reinsert S Pen: Remember to attach the S Pen when you have finished using it.” That’s pretty smart, Samsung. Gorgeous flower shot, though, in real life, these flowers weren’t quite that orange. Samsung’s Galaxy Note 9 12 MP Dual Camera is just as impressive as it was on the Galaxy S9+. It has the 2X optical zoom, image stabilization and switchable aperture, all of which resulted in detailed, high-quality photos. 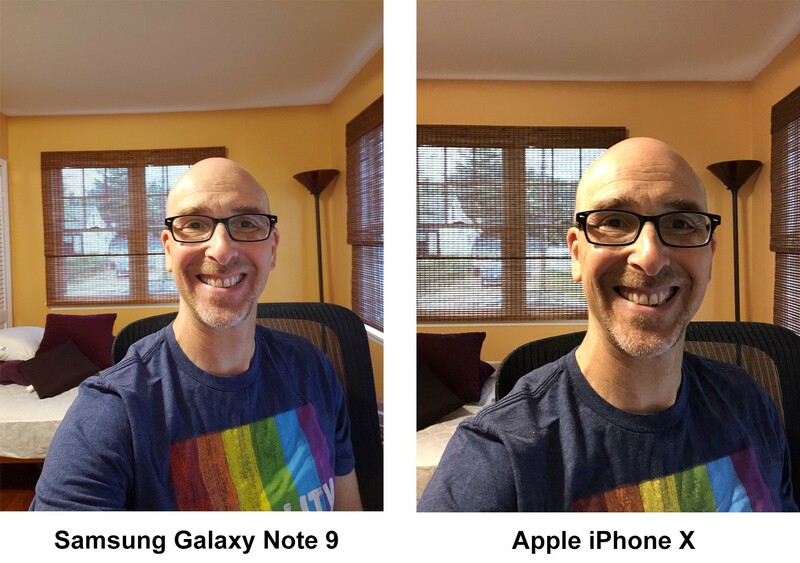 The adjustments Samsung made in high dynamic range and low-light performance were noticeable when I compared with similar photos taken by Apple iPhone X’s excellent 12MP camera. In multiple tests, the Note 9 managed to find light where there was virtually none and in at least one instance, its auto HDR did a better job of correcting highlights and lowlights in a photo. Two cameras, on shot. Only the Samsung Galaxy Note 9 manages to maintain the foreground and cloud detail. 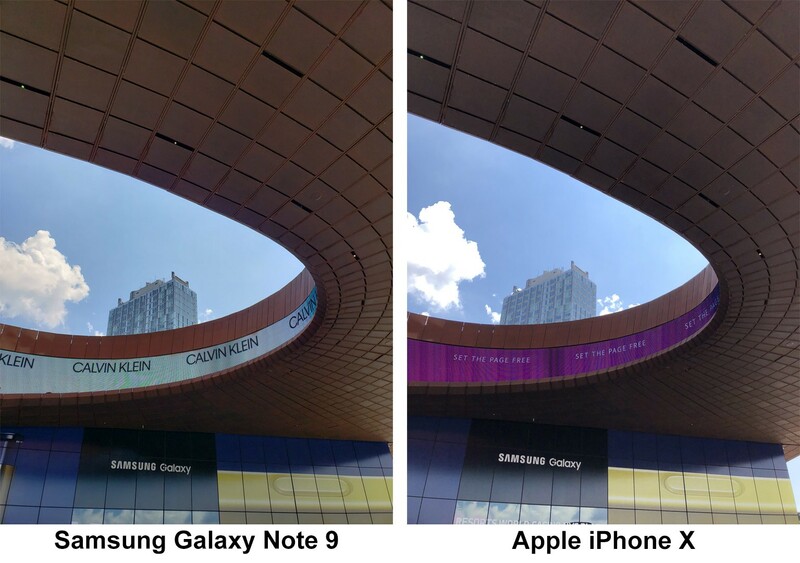 Samsung’s image capture technology still over-saturates images (the sky is not that blue), but many people appear to prefer their version of enhanced reality. The 8 MP selfie camera does a fine, job, though it, too, has a habit of over-bright colors and skin tones. Even with the auto-enhancement turned off, my skin is too pink and shirt color off by a shade or two. I don’t mind looking better (maybe younger) in my selfies, but I still prefer truth in imaging. Speaking of selfies, the Note 9 pulls in more light and makes me look a little better than I really do. 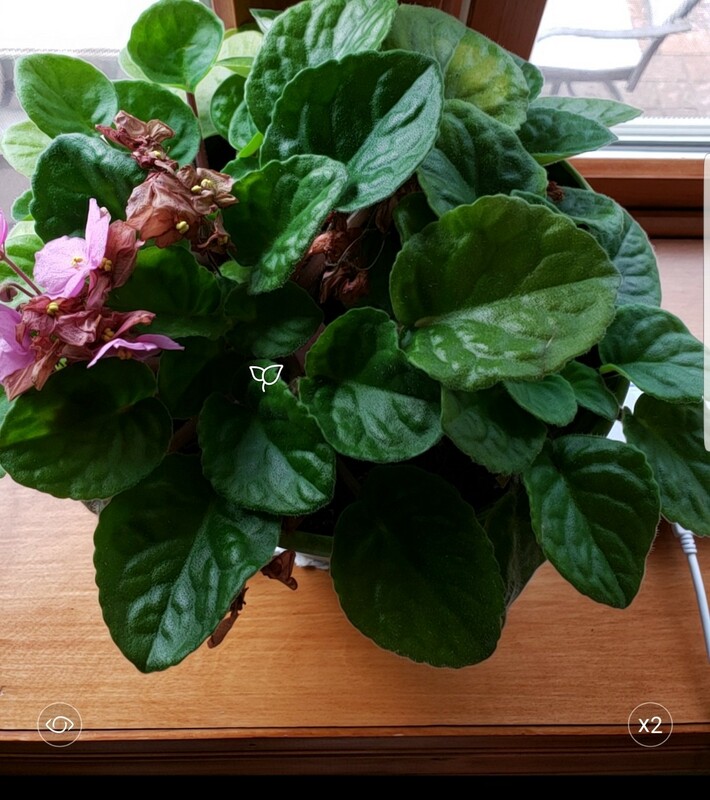 Samsung’s camera can, in my experience, accurately identify scenes, like flowers, food, people and buildings (tiny scene icons appear to let you know how the phone’s identifying it) and then auto adjust the settings. Since I already expect the auto-settings to adjust for the scene, this ends up being a little like a neat parlor trick. It’s hard to tell if the scene filters are making my photos better. 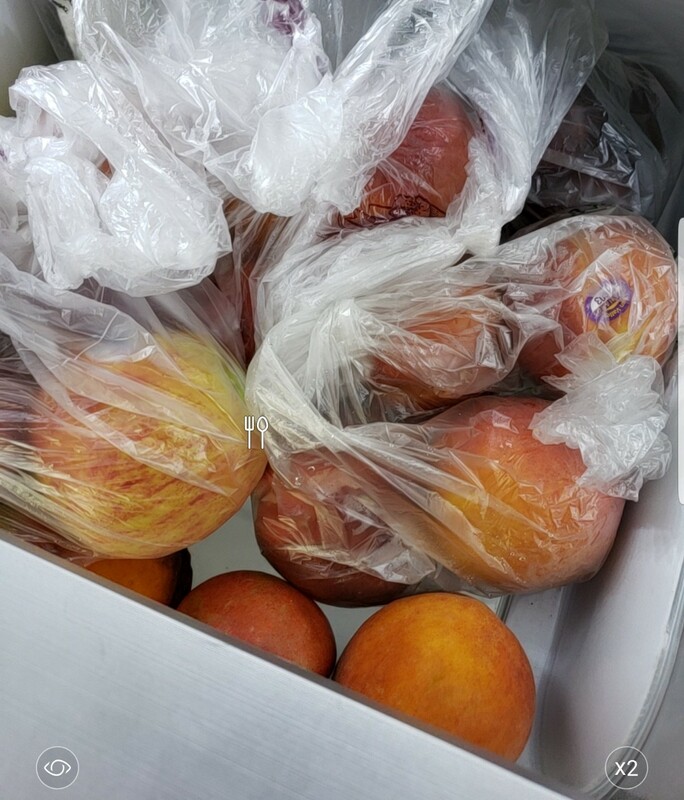 The camera identified this fruit as food and the plant as a plant. Note the tiny plant and fork and knife icon on top of each image. 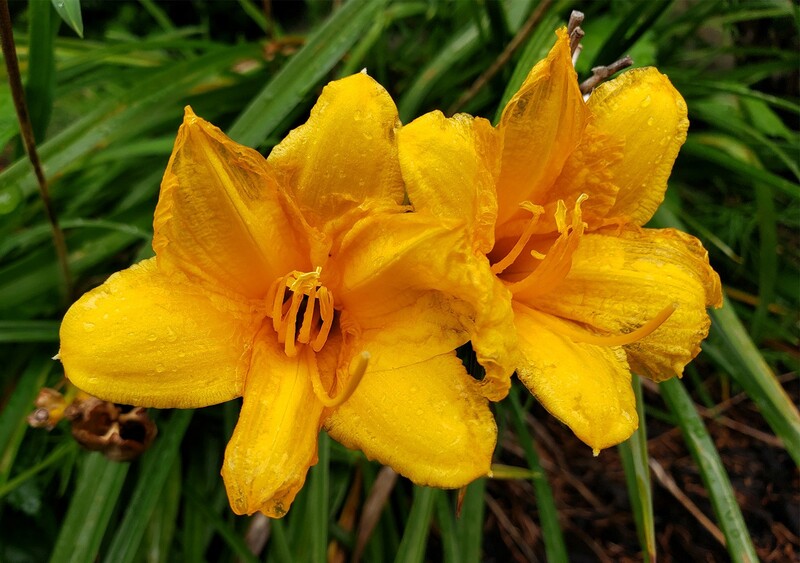 Samsung’s Live Focus, an answer to Apple’s Portrait Mode, appears unchanged from the Galaxy S series. 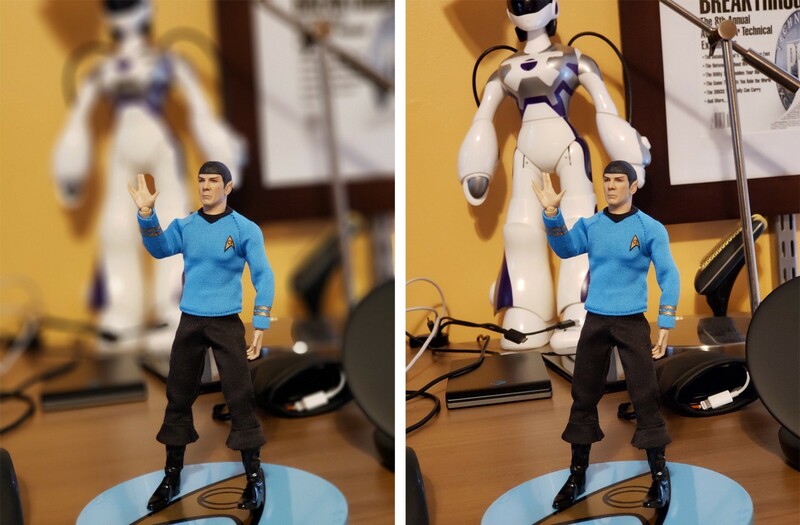 Unlike Portrait Mode, Live Focus lets you edit the degree of background defocus after you’ve taken the picture. I like having this degree of bokeh effect control and the images look professional. Same photo, I just adjusted the Live Focus effect. I had tremendous fun with the 960-fps super slow-mo camera. Yes, you need some luck and a steady hand to capture some truly amazing shots. First, you have to hold the phone still. A tripod works well here, but then limits the serendipity. There’s no way I could have captured my bee shots without moving around to find a bee about to take off from a flower or tree branch. In addition, you can only capture a few seconds of slow-mo at a time, so if the bee moved, but didn’t fly, the shot was kind of blah. With a little patience, though I got some very cool stuff. It’s hard to believe what’s possible with a smartphone these days. With its Qualcomm Snapdragon 845, the Samsung Galaxy Note 9 is running the best in Android mobile processing. The Octa-core CPU has, according to Geekbench Performance tests, two clusters, one running at 1.77 GHz and the other at 2.8 GHz. It’s backed by 6 GB of RAM. The Note 9 performance numbers come close but do not beat those of Apple’s A11 Bionic (I did an anecdotal Fortnite launch test and the results were predictable), but those numbers do not tell the full story. Everything about the Samsung Galaxy Note 9’s performance is as smooth as butter and as responsive as a Family Feud contestant with the right answer. No matter the task, from Web browsing and video playback to video editing and document creation, The Note 9 shined. It’s also an excellent mobile gaming device. Samsung secured early, exclusive access to the Fortnite beta. After downloading the game and logging into my Epic account I played and played and played and played. Naturally, Fortnite looks amazing on the 6.4-inch infinity display. The audio is so loud and sharp (backed by Dolby Atmos and tubed ky AKG)that I angered my entire family when I unexpectedly ended up in an intense fire fight. Playing a game like Fortnite, especially in Quad HD mode is a surefire way to accelerate battery life consumption. Samsung rated the monster 4,000 mAh battery for 24 hours of battery life. In Full HD+ screen mode at medium brightness I got at least 18 hours. When I turned it up to QuadHD and spent hours playing Fortnite, I got closer to 12 hours. The rule of thumb in battery life projections is that the only way to get the max is to do nothing but watch video. It’s the least CPU-intensive, and thereby battery-intensive, operation. Wish I had a watch for this charger. 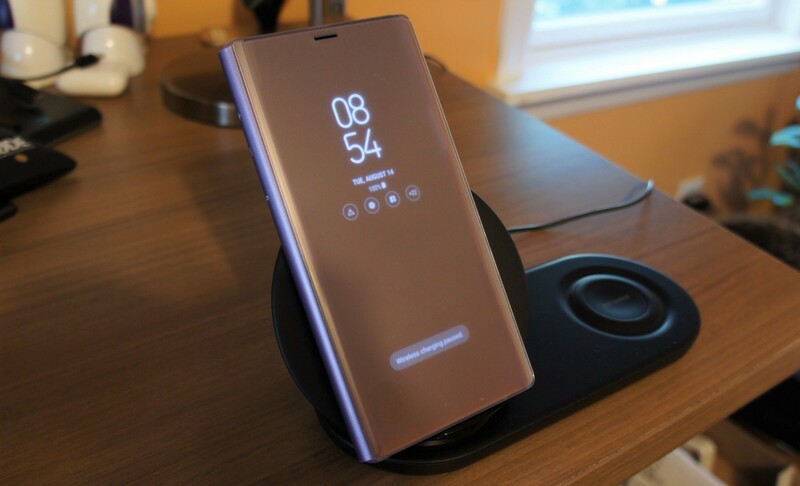 Each night I rested the Note 9 on the $119 Samsung Duo wireless charging base. It had no trouble fast-charging through my purple Note 9 case. Essentially waterproof, the Note 9 can handle a drop in up to five feet of water for 30 minutes. I put the phone under running water for a minute and then dried it off. I think this guy is ready for the beach. While I’ve long preferred iOS to Android, many of the frustrations I had with Google’s mobile platform are gone. It’s better organized and, in general, offers an excellent gesture-friendly interface. For a big-screen, button free phone, I miss the iPhone X’s ability to sweep up from the bottom of the screen to return home, but Android’s virtual home button that I can access from any screen is a decent substitute. During my tests, I chose to hide the navigation bar, which meant I did need to sweep up from the bottom edge to access it. It’s unfortunate that Samsung’s releasing the Note 9 with Android 8.1 (Oreo) instead of the brand-new Android 9 Pie. I suspect part of the reason for this is Samsung’s platform customization. There’s the Apps Edge that lets you sweep in from the right edge for quick access to a customizable set of up to 10 apps and 10 contacts. There’s the collection of Samsung’s own apps for Mail, Calendar, Web Browsing, Messaging and Health (yes, the Note 9 is an able fitness tracker) There’s Bixby, Samsung’s voice assistant, that’s now almost as smart as Apple’s Siri. The more Samsung customizes Android, the harder it is to integrate fresh mobile OS builds. I tend to steer clear of most of Samsung’s apps. I prefer Chrome over the “Internet” app, Gmail over Samsung “Mail,” and Google Calendar over Samsung “Calendar.” And I wish that Samsung’s “Search phone” bar was integrated with the Google Search bar that sits dead center on the default home screen. These kinds of Android conflicts keep me up at night. Samsung keeps improving its digital voice assistant. That Google Search box is also a perfect illustration of yet another fundamental Android and third-party partner flaw. The box has a “Say ‘Ok Google” message in it, a call to use Google Assistant. Samsung Bixby, meanwhile, isn’t visible on the home screen. Samsung gave Bixby its own physical button on the left side of the phone right below the volume rocker, but there’s no way Bixby can become a thing if, on Samsung’s own device, it’s playing second fiddle to Google’s more popular voice assistant. 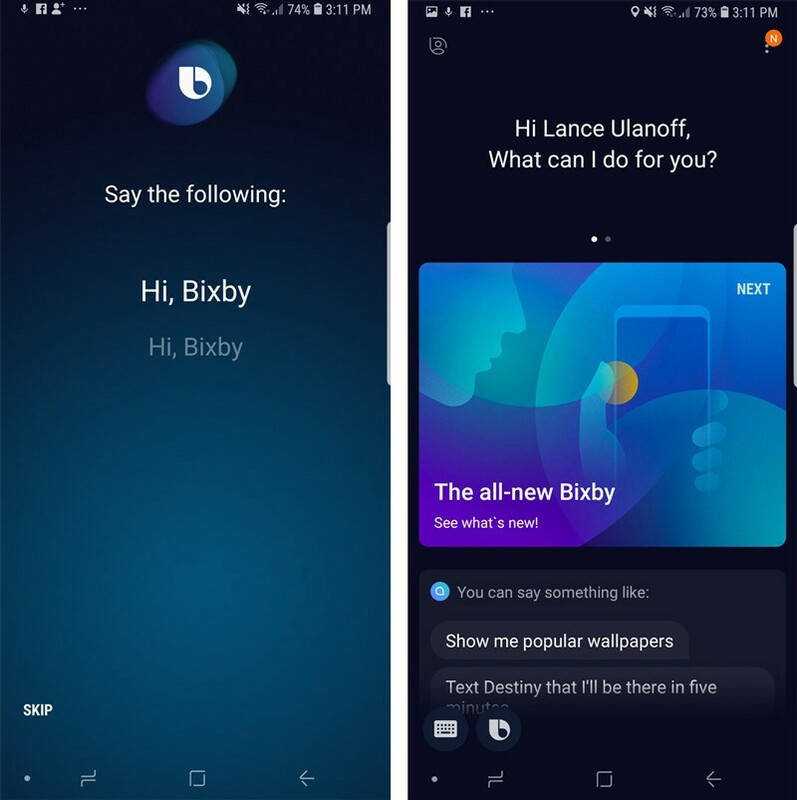 I set up Bixby, which Samsung advised me is not final release software on my Note 9, to respond to “Hey Bixby” from the lock screen (I only used the Bixby button by accident). Then I spent some time using my voice to take selfies, open photos and check my mail. Most of this Bixby did with ease, though it did get stuck at one point, thinking that every request related to Spotify (this is beta software). I also asked Bixby a bunch of general interest questions like the Capital of Missouri and the Square Root of 9. She/it proved smart and responsive. Bixby can also control smart devices, though only if they work with Samsung’s SmartThings platform. A Pen for the rest of us. As $1,000 phones go, the Samsung Galaxy Note 9 is one of the best. Is it too big and heavy for me? Maybe, though, I found that the more I used it, the less I noticed the considerable heft. The curves make it feel smaller than it is, though I suspect anyone with smaller hands might be overwhelmed by the size. I’m an unabashed fan of the S Pen. It truly sets it apart from all other phablet phones. Is the Samsung Galaxy Note 9 expensive? Sure, but if you’re considering a 128 GB Samsung Galaxy S9+, what’s another $110?